This classic charmer features plenty of outdoor living space with a screened porch and two covered porches. A front-entry garage adds convenience, while dormers welcome light into one of the two bonus rooms. 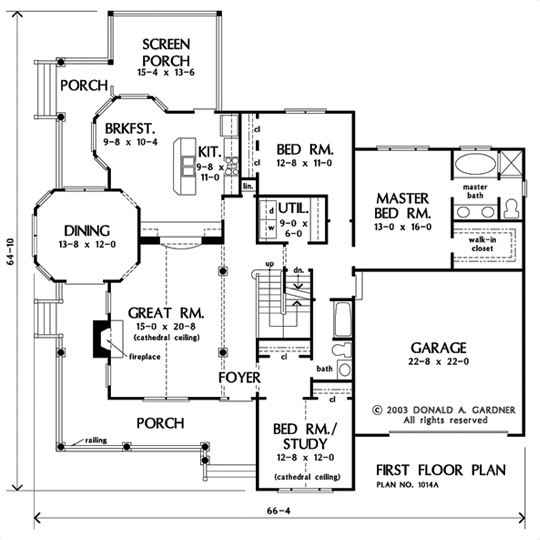 Windows surround the dining room and breakfast nook, and the open kitchen includes a pass-thru and island. 1st Floor: 2005 Sq. Ft. 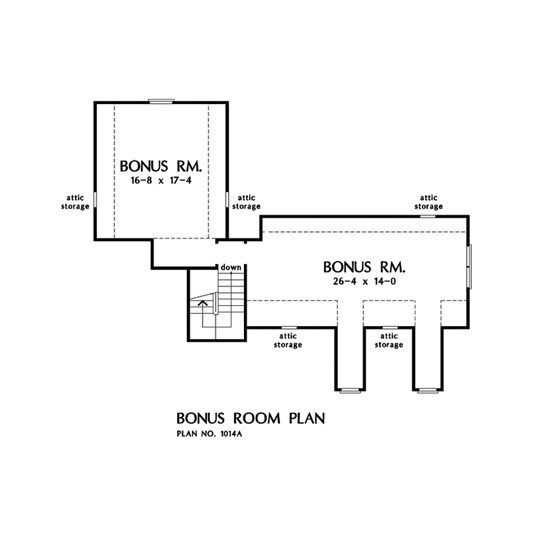 Bonus Room: 827 Sq. Ft.
Porch - Screened: 191 Sq. 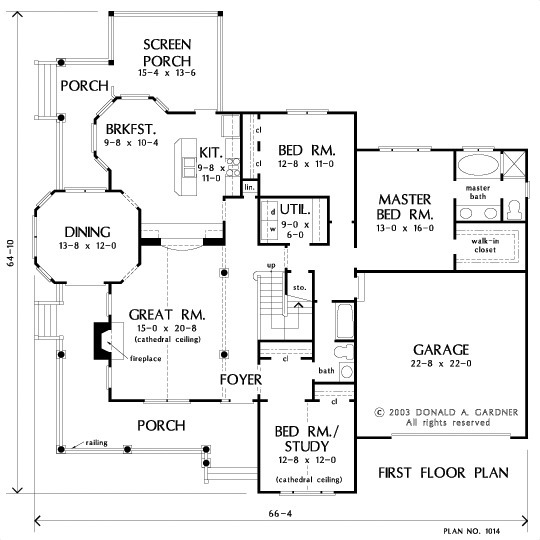 Ft.
House Dimensions: 66' 4" x 64' 10"
Great Room: 15' 0" x 20' 8"
Utility Room : 9' 0" x 6' 0" x 9' 0"
Bedroom #2 : 12' 8" x 11' 0" x 9' 0"
Bedroom / Study (Cathedral): 12' 8" x 12' 0" x 16' 0"
Bonus Room : 26' 4" x 14' 0" x 8' 0"
Breakfast Room : 9' 8" x 10' 4" x 9' 0"
Dining Room : 13' 8" x 12' 0" x 9' 0"
Foyer : 4' 4" x 27' 0" x 9' 0"
Garage : 22' 8" x 22' 0" x 0' 0"
Great Room (Cathedral): 15' 0" x 20' 8" x 17' 2"
Kitchen : 9' 8" x 11' 0" x 9' 0"
Other : 16' 8" x 17' 4" x 10' 0"
Porch - Rear : 5' 0" x 17' 8" x 9' 0"
Porch - Front : 27' 0" x 7' 0" x 9' 0"
Porch - Left : 7' 0" x 15' 0" x 9' 0"
Porch - Screen : 15' 4" x 13' 6" x 9' 0"